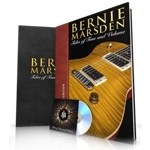 More than forty years as a professional musician has enabled Bernie to put together one of the most eclectic and iconic guitar collections in the world, and 'Tales of Tone And Volume' displays this in majestic fashion. The book is abundant with anecdotes of his career, each connected with one or more of his guitars. The state of the art photography shot by Melvin May enable people to see his guitars as they have never been seen before, making every page an exciting turn. See the guitars up close and personal that have been used (and abused!) in the studio, on the road, on television and to write some of the greatest Rock songs of all time. Rocktopia and Fireworks Magazine took the opportunity to spend some time with Bernie and talk about the book and his extensive career. An excerpt is contained below on the origins of the book 'Tales Of Tone And Volume'. "The book is a combination of forty years of collecting guitars (well acquiring really, as if I was a collector I have would have more!). I would buy three guitars on an American tour and subsidise paying for one by selling the other two. For every ten I had, I would have had thirty if I was a collector! Over the years, they go into a lock-up and you forget you have them; I spoke to a friend in the publishing business who said I should do something and we have ended up with an A3 book with 400 pages. There are anecdotes for each of the guitars and the book is built around the 1959 Les Paul ["The Beast"] which had a history well before I got it in 1974. When I started collecting guitars in the 70s there were no such thing as vintage guitars - they were either new or second hand! The Gibson Les Paul started in 1952 when Les Paul was the epitome of a Rockstar; by the late 50s his fame was much reduced and Gibson weren't selling that many and went to the SG range, What they couldn't foresee was that Jimmy Page and Eric Clapton and any people of note in the 60s would be using these Les Pauls from the 50s and so they were reintroduced in 1968. I got "The Beast" from a fan of a band I was in (Wild Turkey); he came to me with this 1959 Les Paul and said he thought it would suit me. I ran into him later in the Marquee and I said the guitar was the best investment he and I had made - he said he thought it was strange Eric Clapton let it go. He had never told me it belonged to Clapton, then Paul Kossoff, then Andy Fraser and then this guy!" Bernie Marsden will launch 'Tales of Tone and Volume' at Selfridges on Oxford Street, London on Tuesday December 4th at 7pm. Bernie has recently partnered with Selfridges and allowed 20 of his guitars to be featured in the Selfridges windows on Oxford and Duke Street as part of their Christmas Rock 'n' Roll campaign 'Santa On Tour'.